Karina's Kreations: Stampin'Up Vertical Garden Kit! 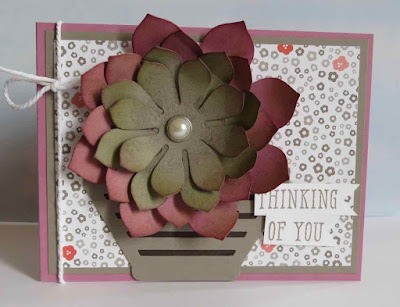 This cute card was made with the Stampin'Up Vertical Garden Project kit #143635. The flowers come die cut already and you can make the project as shown on the box or I used some of the flowers to make a cute card. This is one of the cards we are making at my spring stamp camp on March 19. I have two spots left if you want to attend. This card also uses the Window Box Thinlit Die #142762 and Succulent Garden Designer Series Paper #142778.